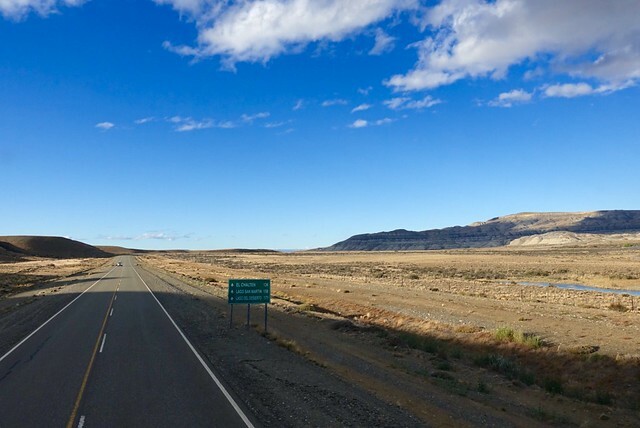 Today is the long long boring bus ride to El Chalten in Argentina, a small town that will take all day to get to, with a stop over in El Calafate to change busses. 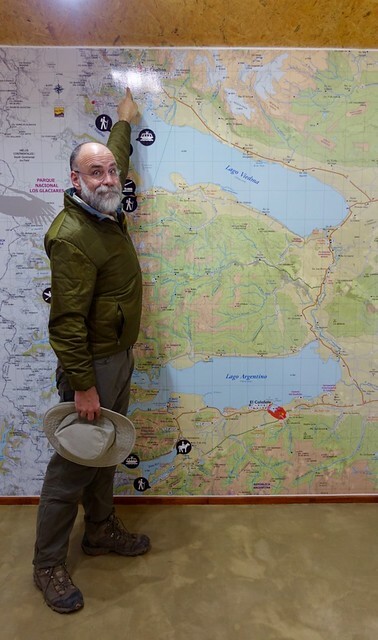 We were up and out of the lovely Hotel Remota at 7, and made it to our bus at 7:30, heading north and east to the border crossing into Argentina just past Cerro Castillo. 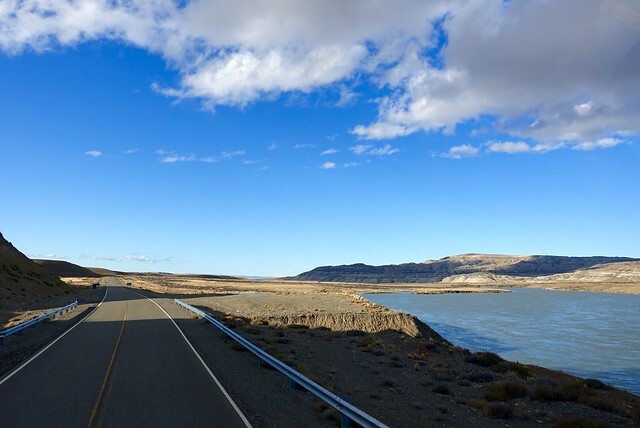 It was a typically tedious crossing, papers and stamps and waiting, and the bus lumbered into El Calafate too late to make the connecting 1pm bus, so we had several hours to kill. Our first challenge for Argentina is to get cash. This is a country that has a very touchy relationship with money--the previous petulant government, just out of power, had some imposed some silly restrictions such as limiting the amount of cash you can take out from an ATM at one time, and setting stupidly low exchange rates as well. When we booked the trip, the official exchange rate was 9 pesos per US dollar (a black market rate is better! ), but the new government had removed that silliness and now the rate's around 15 per dollar. But we couldn't quite figure out how to get cash out of the ATM--we kept on getting "CASH LIMIT EXCEEDED" errors for 2500 pesos, 2000 pesos, 1500 pesos. We tried Santander Rio (is that a real bank, and why isn't it just Santander? ), Banco Patangonico, and the Banco Nacional. Each time we were warned that it'd cost us 91 pesos, but we couldn't get any money out, and eventually Chris figured out that 1400 pesos was the maximum amount. Feh. That's only $90, and it costs about $6 in ATM fees. Great job Argentina in self-destructing your banking system. Guess we'll be going back to the ATM over and over. So, once we had a tiny bit of money we could go explore. 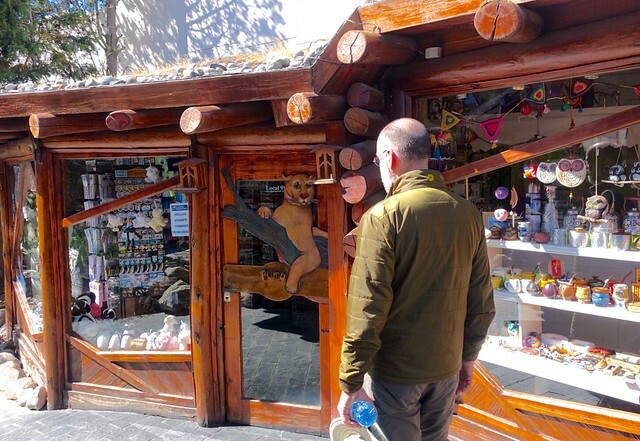 El Calafate is a curious town, on the south shore of a large lake, in a dry landscape far east of the mountains that looks like eastern Washington state, or perhaps west Texas. 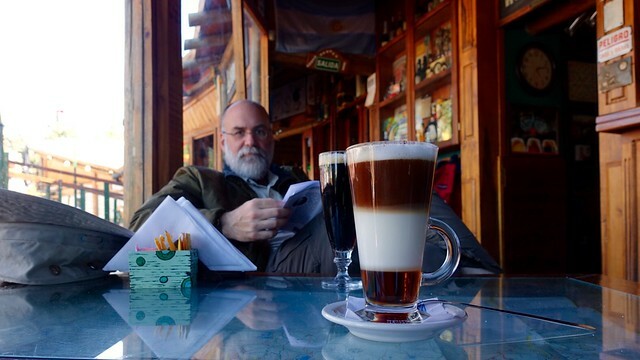 It gets a fair bit of tourism from Buenos Aires, but we couldn't quite see why, there's not much to do there, it's like taking a weekend in Pasco, not exactly romantic. We didn't quite know what to do--eat?--and while the town itself is kinda large, it's still pretty much one main street, so we walked to the west to scope things out. 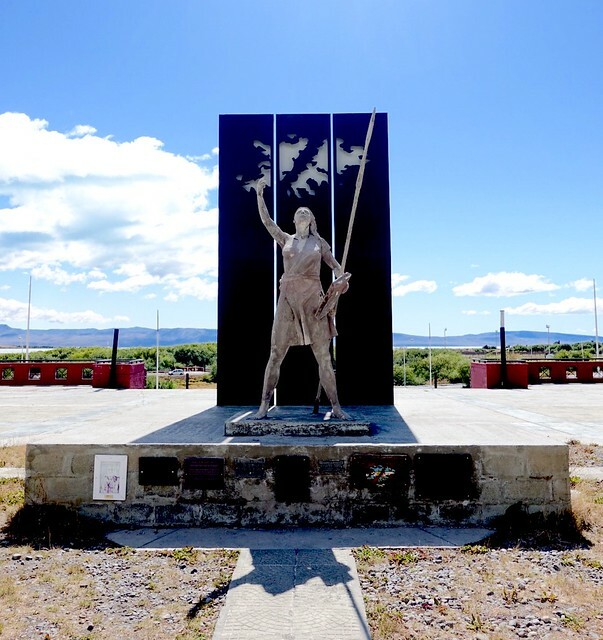 We found a weedy monument to the Falkland Island war of 1982, a microbrewery where we paid $48 for two pizzas, two empanadas, and two beers, and then... just wandered around, trying not to get too excited by the jams and wool things in the shops. 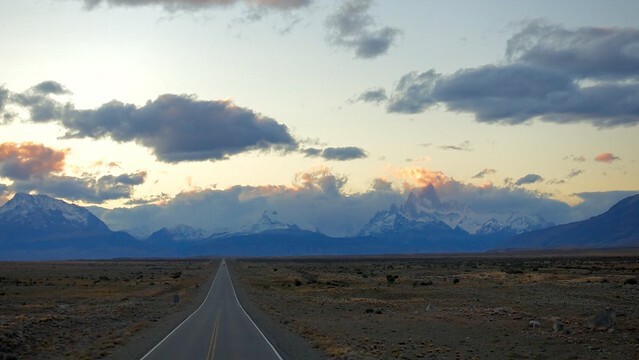 Then we clambered on our evening bus, drove and drove and drove for 3 1/2 more hours to El Chaltén, and headed to bed. Not a particularly thrilling day, but hey, 'they can't all be winners, kid'.